Learn about the ways you can use art at the Harn in your teaching. With more than 11,300 works of art the Harn Museum of Art offers faculty opportunities to help their students experience art, history and culture, sometimes in unexpected ways. The collections strengths focus on African, Asian, modern and contemporary art, and photography, but collections include Latin American art, Ancient American art, prints, works dealing with natural history subjects, and a range of other areas periods and themes. Browse the collections area of our site for more information. We offer class tours, assignment collaboration and up-close engagement with art, valuable to many disciplines. Contact Education Curator of Academic Programs Eric Segal at 352.294.7063 or esegal@harn.ufl.edu to brainstorm how the Harn can help support your teaching and research. Classes or groups may tour the museum during all hours of operation. Groups of 10 or more should make an appointment to ensure a successful experience and avoid conflicts with other touring classes. 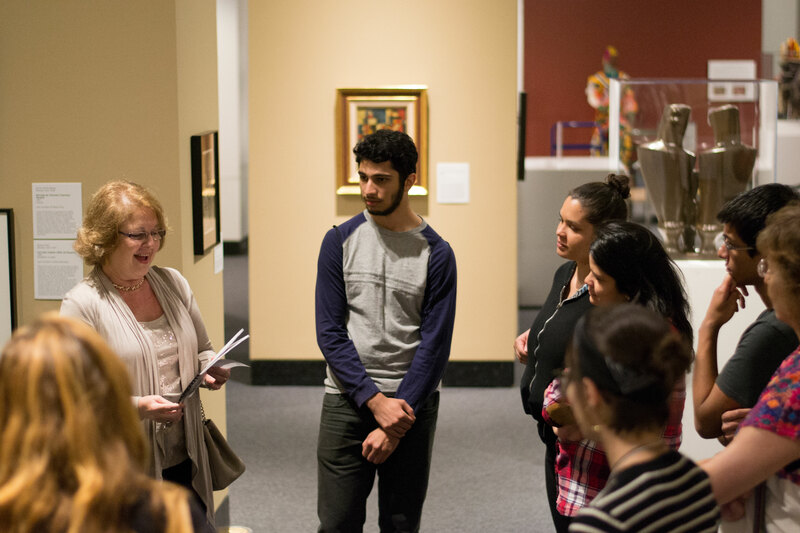 Guided tours and presentations by Harn curators and staff can be organized to connect with your classroom objectives in virtually any discipline. Docent tours on general or specific topics can be arranged for groups of 10 or more and must be scheduled three weeks in advance. Tours in Spanish are also available. Open your students up to the experience of studying objects first hand. Instructors may select works from the Harn’s extensive permanent collection for use by individuals and small groups in the museum’s object study rooms. This opportunity is open to all disciplines and allows for the direct examination of art to encourage understanding of diverse cultures, historical periods and materials. Browse our eMuseum database on the collections area of the Harn website to view a partial listing of objects. Funds from the Dr. Madelyn M. Lockhart Endowment for Focus Exhibitions support creative collaboration between UF faculty and the Harn. We work with faculty to develop small art exhibitions emphasizing research and teaching interests of the faculty member. The Harn Museum of Art offers a number of resources, including access to the Bishop Study Center, a library offering books, magazines, newspapers, videos and additional references for use in the facility. Instructors are also invited to register for the Harn Museum Educator Resources Program, which allows the short-term loan of videos, literature and curriculum support materials free of charge. For HUM 2305 What is the Good Life?, Harn staff developed a special audio tour that serves thousands of students by providing them with a thematic tour of art related to course themes exploring economic, philosophical, religious and cultural foundations of a good life. For GEO 3803 - Geography of Alcohol, the museum’s collections enhanced student understanding of the material culture of the production and consumption of alcohol in different cultures. The Harn hosted and supported SPN 3324 Spanish in the Museum, an innovative course developed and taught at the museum. Engineering faculty take students behind the scenes at the museum to study its HVAC system designed to meet special requirements. Doctoral students in WIS 6934 Tropical Ecology were set a task to identify birds depicted in nineteenth-century prints. Their research project is documented here. We are eager to connect with faculty in all disciplines--whether in Art History; English; History; Languages; Literatures and Cultures; Medicine; Pharmacy; Physics; Psychology, Veterinary Medicine; or any area--to support their teaching and research. Contact Education Curator of Academic Programs Eric Segal at 352.294.7063 or esegal@harn.ufl.edu to brainstorm how the Harn can help support your teaching and research. At the conclusion of our visit I found the students excited to take today’s lessons and apply them to their own works. As an instructor, I know that today’s visit supports my teaching in a meaningful way and am certain the visit will be a highlight of the semester.